A new 5e-‘zine of mini-dungeons! 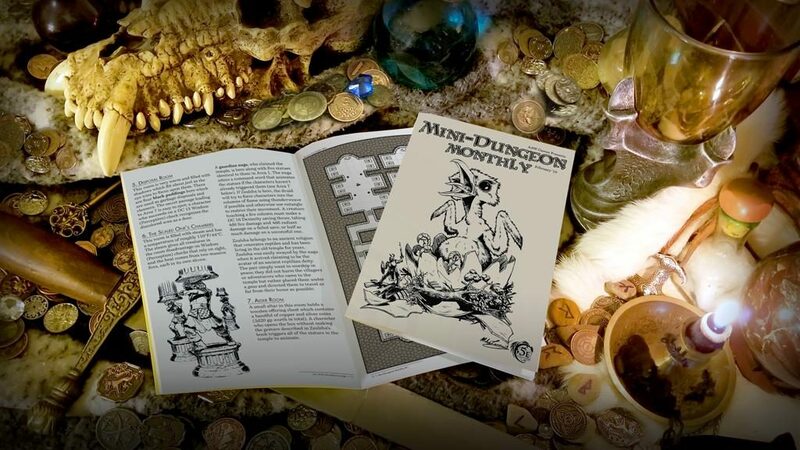 The first installment of AAW Games‘ new Mini-Dungeons Monthly ‘zine clocks in at 20 pages, 1 page front cover, 1 page ToC/editorial, 1 page SRD, 1 page advertisement, leaving us with 16 pages of content, so let’s take a look! How can this review exist? Well, I received an advance copy of the inaugural installment of the ‘zine for the purpose of providing a fair and unbiased review. This being a prerelease review, I will refrain from providing a final verdict, as there are bound to be some minor changes prior to public release, so please bear that in mind! The ‘zine has a highly successful kickstarter running right now, so if you like what you’ll read here, be sure to get on board. All right – at this point, I don’t think I have to explain AAW Games’ mini-dungeons – they are small sidetreks that can be easily run in a convention slot, as extended encounters between big modules, as quick slot-ins, etc. The modules make use of default stats and traps, though often with meaningful small tweaks. As such, I don’t expect epic storylines from them. The series so far has been really useful as a tool in the GM’s arsenal, and this ‘zine seeks to evolve the formula in an old-school-ish b/w-‘zine. Each installment will feature 5 different adventures, as well as VTT AND player-friendly iterations of the maps, which will btw. include redacted secret passages and the like! This issue contains, as noted, 5 mini-dungeons – 3 of them are stand-alone offerings, while two others are parts of a recurring series: Umbravania will continue Ravenloft/gothic horror/Catslevania-ish adventures (super excited! ), and the “Survive!”-Mini-dungeon will be a brutal and deadly challenge for pros…again, something I’m pretty excited about. All right, in order to talk about the modules in detail, I will need to go into SPOILERS. Potential players should jump ahead to the conclusion. All righty, the first module, “the Whispers in the Hollow”, is penned by Jason Andrew Mason and also kicks off the Umbravania line. It is intended 3 – 4 level 2 – 4 characters. A daemon from the Abyss (Nitpick: Shouldn’t that be demon?) was summoned by a black magician, and subsequently bound – however, the maddening whispers of the vile entity permeate the magic barrier, carried by unearthly resonances. Four villagers have gone missing from a nearby village, and it’s up to the PCs to find them – which will have them stumble across the workshop. Exploring the workshop will pit the PCs against the insane villagers (thankfully, 5e allows for the sparing of vanquished foes), and as the stalwart adventurers explore the complex, they’ll be beset by the dread whispers, which continuously erode their sanity in a 5-step progression. Here, we have a sensible deviation from 5e’s standard madness rules, as this effect may be shaken off relatively easily. This provides a unique global effect that an experienced GM can use to make the complex truly unique and further add to the tension. There is a secret room to be found, and the module does something interesting I did not expect – it doesn’t have a win-condition; the daemon can’t be defeated by the PCs at this level. Instead, the goal is to secure the villagers and potentially quarantine the whole area…or, well, unleash the dread entity… A pretty impressive winner, considering the atmosphere it manages to evoke on a mere two pages! The second module, penned by Thomas Baumbach, is intended for 4 level 9 characters – “The Temple of the Fallen Phoenix.” The man known as the phoenix was the guardian and general of a mighty emperor of old, and when said emperor fell to the ravages of time, the phoenix refused to be entombed, instead capturing the temple, hijacking the rituals that would turn him into a true, eternal warrior. You guessed it – this does have a kind of subtle WuXia-theme, though this aspect can be ignored pretty easily. 5 rituals are being performed throughout the complex, with soldiers of the phoenix overseeing the work of the acolytes. Each of these rooms is devoted to one of the Eastern elements. The PCs can divine the means to disrupt the rituals, weakening the mighty general. The mini-dungeon does feature two rather cool read-aloud texts and makes rather cool use of the formula of the mini-dungeons: The Phoenix-turned-eternal-guardian is based on the clay golem, with each ritual changing immunities and traits and the base-line having some cool modifications. All in all, a cool module! The third module, “The Lair of the Mendacious Naga”, was penned by GM Lent and is intended for characters level 11 – 12. There is ostensibly a temple in the mountains, inhabited by a basilisk. But treasures loom, and thus, some brave and foolhardy townsfolk ventured there. They have not returned. As the PCs explore the place, they will find an atrium with enchanted columns that may be triggered by foolhardy adventurers. A gorgon pen and a druid following olden ways make for interesting adversaries – and indeed, a guardian naga is the master of this place. In the case of combat, the temple can become deadly pretty quickly, as the locales have neat hazards/environmental effects that tie in with the target NPCs. The druid, for example, may try to thunderwave targets into alcoves of holy fire. (Minor nitpick – one spell-reference is not italicized and misspells the spell as thunderweave.) Interesting: The naga claims that the villagers were not harmed,m but sent off via geas – further adventure awaits! “The Exposed Nest” is a new adventure by none other than Jonathan G. Nelson, and can be run for four characters of level 10 – 12, 12 – 14 or 16 – 20. This one is pretty amazing – it comes with a brief read-aloud text to set the scene and has an easy premise: Demon slayers tried their hands at robbing the nest, but haven’t been successful. A ginormous tree houses a vast nest, and movement from branch to branch, falling, etc. is covered. Cool: The respective areas note when PCs are exposed to the roc hatchlings above. Scaling the tree is not easy – weird and icky worms, bird droppings ( Roc-sized…), sap-covered branches – really cool sequence! And when the PCs get up, they’ll be faced with cute, cuddly harbingers of death, roc hatchlings! The difference in levels noted above? Well, a table determines how this damn cool combat works (when/if the parent intervenes). And yep, the demon-slayers? Did not live to tell the tale…loot to be found…provided you don’t mind items forged in Hell… The roc hatchling does come with full 5e stats, though the Hit Point value here is off (should be 150 RAW, provided Constitution is correct), and the statblock may lack a senses line denoting passive Perception, but it does note its Perception value, so no problem there….though the roc’s Perception should probably be +3, not +4. I’m also pretty confident that the beak attack should have either a +9 damage modifier, or +6. As noted in the beginning, this review is based on the pre-release copy of the ‘zine and as such, I won’t pass final judgment here regarding the final properties, but the map stretchgoals met so far have me excited. The ‘zine features pretty damn cool b/w-artwork, and the cartography in b/w is also nice. My copy already has full bookmarks for your convenience. Justin Andrew Mason, Thomas Baumbach, GM Lent, and Jonathan G. Nelson all know what they’re doing: The Umbravania mini-dungeon is impressive, and I really hope that the ‘zine takes off and that we’ll get to see a lot more such adventures; Justin manages to evoke a surprisingly dense atmosphere there. Surprising for me, the more classic fantasy modules did not fall behind: Thomas Baumbach’s module can be easily reskinned into a variety of contexts and feels like neat high-stakes; GM Lent has also an interesting twist here, as the module, in theory, could well work sans combat if the PCs are clever. The Survive module is surprisingly technical and a brutal war of attrition…but thematically, my favorite is easily “The Exposed Nest”, as it’s an angle I wouldn’t have conceived of. It’s playful, challenging and unique. Really like it! So, a tentative summary: I liked all of the modules herein. They cover a variety of tones, and all of them have something special going on for them. I am pretty excited to see the final version, and seeing how refined this already is, I am super-excited for the future of this ‘zine. It seems like AAW Games has learned from all the mini-dungeons released so far, and is gunning to bring them to the next level. So yeah, I can recommend checking out this kickstarter – but decide soon! It’s ending in 21 hours! You can find the kickstarter here!